Looking for a cheap or discount ceiling fan? You've come to the right place - I've got a selection of discounted ceiling fans available for review and purchase. Some additional advice. To get the best fan for $150 and under, there are many routes you can take. 1. Buy used. If you're lucky, you might be able to get a $300+ fan for under $20. Of course, this is always hit and miss. Most used fans are missing pieces or have repair issues. This is really only an option if you are familar with ceiling fans and have technical know-how. 2. Similiar to the above: buy overstock and/or closeout products. Here you're getting a brand-new fan with warranty at a much reduced price. 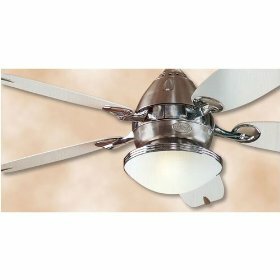 Many internet lighting showrooms offer over closeout and overstock specials posted directly on their sites. 3. (the most important): Dont go for a fan with a lot of fancy design or features, you're paying for those things, not actual quality. For example, dont got for a fan with a remote or a stained glass light or a cutting edge design. Get the simple, stripped down, brass & wood (or all white) fan without all the extra features. Example: Casablanca Concentra. Hunter Sojourn. I believe Hampton Bay even has a higher end, simple model, but I forget what it's called. The Cameron maybe? The Craftmade CXL. Etc. 4. Look on eBay for NIB and factory-renewed items. Often times you find a good deal, but dont forget to factor in shipping. Please come view more cheap ceiling fans at our sister website, Ceiling Fans 101. 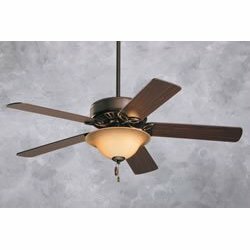 There we have a selection of all kinds of fans, as well as more discount ceiling fans.